It was a hot July because it’d been a hot year and the weather in 2017 hadn’t given much of a damn as to the comfort of human beings, let alone grapes. But one day at the end of that month, just as the sun started declining from its scorching perch, I hopped in to Raimon Castellvi’s Land Rover to head down to his new cellar in the village of Els Guiamets. To back up it’s worth mentioning the wines through which I originally met Raimon are those of his first cellar, Encastell in the village of Porrera. Having tasted successive vintages, I’m always enthusiast about the wines and how they perfectly represent Priorat through three levels of complexity in the Marge, Roquers de Porrera, and then the two single-vineyard wines of Roquers de Samsó and Roquers de Garnatxa. Truly lovely wines that I wholly recommend checking out to see not only an excellent expression of the region but of this small village where I called home for several years. Unbeknownst to me, Raimon isn’t originally from Porrera. It’s his wife’s birth village and he’s actually from Els Guiamets that sits down in the very southern part of the county. His mother still lives there in the old family home, Cal Bessó. It’s a curiously-named house as bessó in Catalan means, “twin” and as such they’re always referred in pairs as in els bessons are “the twins”. So what we have here is the “House of the twin”. I’m not sure what happened to the other twin or if they just didn’t get along but it’s in the cavernous basement where Raimon has built-up a new cellar to produce wines in DO Montsant. Long gone are the days when no one from DOQ Priorat would consider touching DO Montsant wine. The two appellations share the same county and the founding of the later in 2002 definitely had some contentious moments. 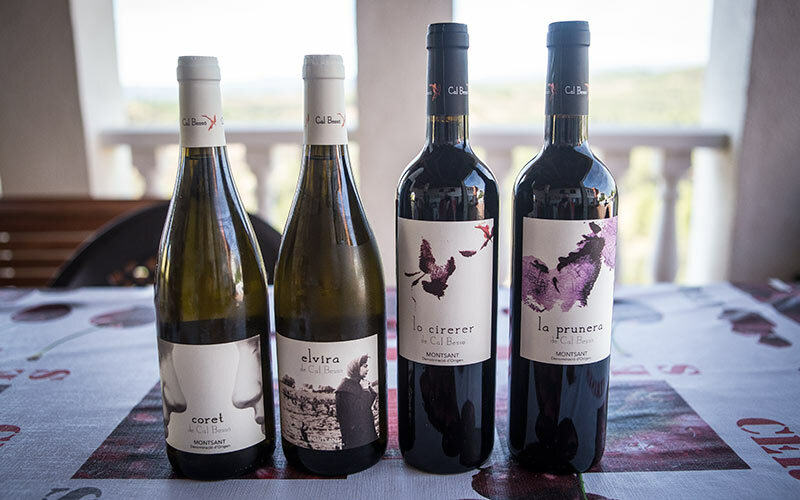 But now, there are several people who have wineries in both which as Alfredo Arribas puts it is because “they’re just two sides to the same coin”. I couldn’t agree more and I was very happy to see someone whose has such admirable wines in DOQ Priorat make wines in the neighboring DO. There is of course the idea that once you have one cellar, doing another is not that big of a deal, like if you have one dog, what’s one more? There is some truth to this as certain things overlap, but despite the old thinking that Montsant is just “cheap Priorat”, in reality, it’s a very different territory and so the approaches used at Raimon’s winery in Porrera don’t work the same in Els Guiamets despite the fact they’re a mere 13km from one another. Montsant wines have to be taken in their own, very separate context. Their first harvest in the cellar was 2015 which went well but Raimon is still testing the waters with each vintage, now having completed their third in 2017. There is a marked evolution of the wines as they work to understand the vineyards from their viticulturist partner in the enterprise. This is going to be great fun to watch how they evolve and grow this cellar. It’s equally great that yet another boutique cellar has now been added to the list in the constantly-refining and growing DO Montsant. From vineyards both over 50 years old. Dark prune and cherry, touch of mint, eucalyptus, tea leaf, crunchy calcium notes. Light and balanced in the mouth, crisp, light citric notes, density but fully managed and a long finish. Punch of grapefruit accentuated by the lees notes, yellow blossoms, sweet honeysuckle, light honey, almond blossom, blue fruit notes. Quite balanced in the mouth with a good degree of texture to it and a longer finish. Dark cherry, forest herbs, touch of mushroom and forest floor, creamy vanilla notes and a bit of graphite minerality. Rich and fruity on the palate, really pops in the mouth with freshness despite the lessened acidity and has good persistence. Light white peach, stone fruit, dried apricots. Downplayed citric notes. Full, plush and crisp on the palate, good citric lemon notes that persist into a medium length finish. Light cantaloupe sweetness in the finish. I met Raimon last year at his Celler Encastell, great person, great wines. He was too kind and sold me one of his Roquers de Samsó. I would like very much to know his new project at Cal Bessó.